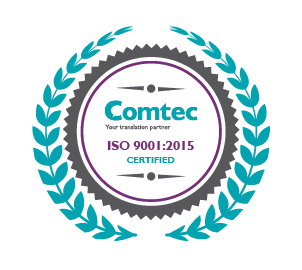 We are delighted to announce that Comtec Translations is leading the way in the languages industry by becoming one of the first translation and interpreting companies to attain the new quality standard ISO 9001:2015. We are among a select few firms that have both this updated certification and the translation industry specific quality standard ISO 17100:2015. The achievement reflects Comtec’s commitment to excellence and reputation for reliability that has built up over more than 30 years in business. Sophie Howe, Director of Comtec, said: “Quality has been our watchword since the very first days of Comtec and I am delighted that our team has achieved ISO 9001:2015 so swiftly. “Having the most up-to-date standards and systems in place certainly helps us to achieve our goal of working with our clients to become a true ‘translation partner’ that adds value to their businesses. “From hand-picking linguists to ensure their specialist knowledge is the perfect match for each assignment to asking every client for feedback on our service, we are committed to delivering the very best results. From offices in Leamington Spa and London we draw upon the expertise of a network of skilled linguists who together can translate and interpret more than 200 languages from Afrikaans to Welsh. Our comprehensive, collaborative, creative and quality-focused approach has helped us enjoy double-digit growth and expand its services over the past five years. At Comtec, we adopt a “zero fault” approach based on providing consistent quality irrespective of the complexity or specialism of any translation or interpreting assignment and delivering either early or on time, every time. Quality assurance is applied to every stage of our business from initial enquiries through to after-sales feedback. We also use technology to offer additional benefits and have in-house developers who tailor solutions for individual clients. The international standard ISO 9001:2015 is a major revision of the previous standard. Consequently, many organisations that held ISO 9001:2008 have not yet managed to reach the updated standard. Comtec also holds Cyber Essentials certification, a government-led scheme in the UK which ensures that companies have adequate systems in place to defend against cyber-attacks. To find out more about Comtec’s translation services, please get in touch.